A One and a Half Hour Dive on the USS Spiegel Grove?! Yes Please! Andy Kunig, PADI Training Consultant, Course Director and super keen Tec CCR diver reports on the advantages of rebreathers. Recently, I was fortunate enough to participate in some technical diving with fellow PADI Course Director and PADI Tec Trimix Instructor Trainer James Weber on some of the South Florida Wrecks. One of our initial dives was completed using open circuit on the wreck of the Korimu at a maximum depth of 230 feet (70 Meters) sea water highlighted by loads of pelagic fish to be seen as well as cargo holds and superstructure to explore. During the initial descent the first portion of the ship to come into focus were the very large anchors and chains that held the ship in place during her sinking. I could clearly remember thinking during decompression (as the rebreather divers passed us by) wishing that I had my rebreather for the dive. Ultimately, the rebreather divers were able to complete their bottom times and decompression obligations between 60 and 70 minutes of run time while James and I, on open circuit, had a run time of 93 minutes. 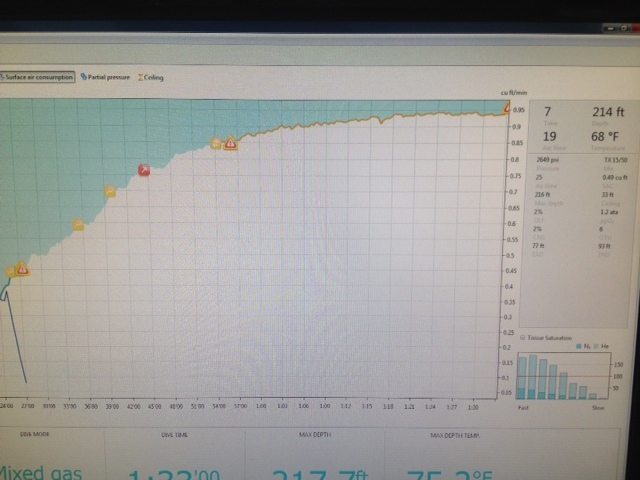 A decided advantage for the rebreather divers, given that the Gulf Stream was further out than anticipated; resulting in a bottom temperature of 68 degrees (16 degrees Centigrade)! Needless to say, a little low for my worn out 3mm wetsuit! Later in the week we traveled to Key Largo for two of the signature dives of the trip. The first was the USS Spiegel Grove. This time, with my trusty Hollis Prism 2 Rebreather in hand, we had a spectacular dive exploring the ship inside and out. Descending on the midship superstructure, located in 68 feet (21 Meters) seawater, we progressed astern along the superstructure until we reached the Well Deck. At the Well Deck we dropped into the well, where the Spiegel transported hovercraft and US Marines during her career, and swam out the loading hatch to the sand where the HUGE propellers were. After swimming through the propellers we ascended on the port side of the ship to just aft of one the large cranes and swam into Well Deck entering a hatch leading through the interior of the ship. We eventually swam through the entire superstructure exiting through the hatches below the bridge. After we exited we came upon the hatch leading into the Anchor Chain Motor Room. We spent some time exploring there as well, even locating and recovering someone’s PADI Advanced Open Water Underwater Navigation Slate. As we moved toward the stern again we swam through parts of the upper superstructure then traveled down several decks where we came upon one of the ships radar screens. Eventually, we swam out the upper superstructure, looked at the crane operators perch, and made our way back to the ascent line. 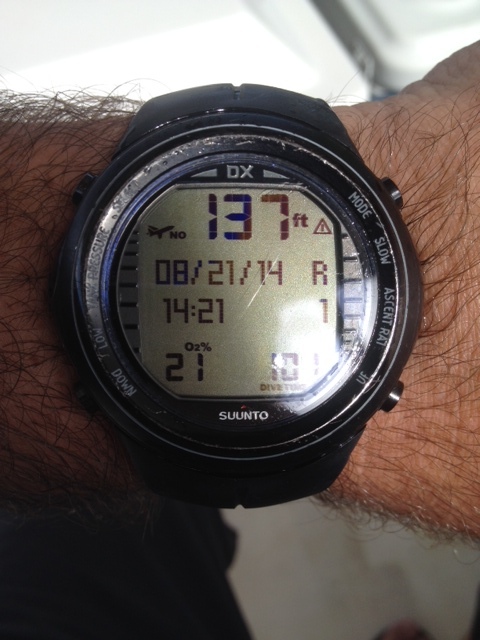 The maximum depth for the dive was 137 ft (39m) and the major advantage of the rebreather was, though we had a run time of 103 minutes, our decompression obligation was a whopping 5 minutes!! The last technical dive of the trip was the Northern Lights in Key Largo at 180 feet (54 Meters) sea water. The Northern Lights has the distinction of being one of the few natural wrecks in South Florida. The Northern Light is one of the first steel hulled ships ever built and her history may have contributed to her sinking. In the 1920’s her former owners decided to convert her from a Great Lakes shipping vessel to an ocean going freighter. Unfortunately, she was too big at 300 feet in length and a 40 foot beam to fit through the lock system. To facilitate getting her to the ocean her owners burned her rivets out and cut her in half then reassembled her after the locks. Once she arrived at her new port of call, Mobile, Alabama, the economy took a turn for the worse and her owners burned her in an unsuccessful insurance scam. The dive today features a very prominent fan tail and very large rudder typical of older steam ships of the era. On her bow the anchor is still attached to the windlass and hanging on the starboard side. Truly, the exceptional part of the dive, however, was exploring the remains of her engine room where her boilers are still intact and very visible. Inside the Northern Light we also noted 4 or 5 very large lionfish! Again the rebreathers proved to be a very worthwhile investment as our bottom time was 5-10 minutes longer than all the open circuit divers yet we passed them during our decompression and surfaced 16 minutes ahead of them! All in all, it was an excellent trip and we are looking forward to diving the South Florida Technical Wrecks again.